A view from the cycle path: Cycling is "booming" in the UK ? Cycling as a mode of transport in the UK is consistently doing slightly worse than "other" and that's been consistently true for a very long time. Bicycle trips per year per person in the UK: 18,17,16,15,16,14,16,14,16. There's no upward trend there, just statistical noise. I blogged about this same table a few weeks back because spurious claims were being made that cycling was getting safer in Britain because of a rise in the cycling rate. Based on the information you see here, some people have claimed that there was a "17% increase" between 2007 and 2008. However, this is a mis-reading of the statistics. There will always be some noise, and this figure for cycling has been bouncing around between 14 and 17 for the last ten years. If cycling is really to "boom" in Britain it's very obvious what needs to happen. It's also obvious what needs to happen with campaigning. Campaigners must stop being exciting about tiny changes in numbers from one year to the next and stop forgetting that small increases are easily wiped out by small decreases either in different years or in different places. Look closely at any figures like this and there will always be some up and down movement. This creeps into all and any collection of figures. Small changes year on year become apparent even if there isn't a real change. This is especially true when you're looking at small sample sizes and very small figures, such as the 1.6% cycling rate of the UK (and the even lower rates in some other English speaking countries). There is only a real trend when the same thing is seen for many years, and the differences seen are outside the bounds of error. For a real "boom" in cycling, instead of an imaginary one, it's also quite obvious what is required of the infrastructure. Let's see no more of the junk infrastructure that cyclists have been fobbed off with already. Cyclists in the UK need the subjective safety and convenient conditions experienced by Dutch cyclists, along with vast amounts of cycle parking, bridges, underpasses and traffic lights designed to benefit cyclists, unravelling of cycling routes from driving routes as well as a decent standard of maintenance for cyclists, and all the other things which are taken for granted over here. Only once a real effort is put into making the conditions right for cycling will people take it seriously as a mode of transport, and only then will the figures head upwards year on year. And yes, it is possible in Britain. Many people still alive were themselves cyclists before the steep post WWII decline in cycling got underway in Britain. In 1949, not only was cycling a major form of transport in Britain, but at that time, British people covered more distance by bicycle than by car and taxi combined. Read more posts about campaigning. Two years later, Joe Dunkley produced the graph on the right as part of an excellent summary of each date since the 1970s when a British minister told the public that cycling was "booming". Joe's done more work and discovered that London's recent "boom" may well be in part due to their having redefined what a cyclist is. For a real "boom", actual progress in infrastructure is needed, not just a public relations exercise based on cooking the books. One thing that I noticed was that the walking mode share was a respectable 22%. Cycling has declined in the last 40 years, but walking has not. One can even see this in popular culture. For example in the cartoon "Andy Capp." When I was young, Andy and his pals cycled everywhere. Now they walk. I wonder if art is imitating life here. In other words, a lot of short trips that used to be made on bicycles are now walked in the UK. A while back at Taipei Cycle, John Burke of Trek made the strong case that if you simply build the infrastructure, people will use it. He gave the example of, I think it was, Louisville, which was hardly a bike-friendly place. Local gov sure turned that around. Real infrastructure built with real cyclists' input will produce real change. townmouse: Spring always brings more cyclists, so around this time of year it's quite normal for observations to be made about how popular cycling has become. This happens every year. However, if there really was an increase over last year it would show in the figures. Minor increases in one place are being offset by minor decreases elsewhere. "Full" and "everywhere" are somewhat relative. I visited Utrecht a few days ago, and of course like all Dutch cities there were bikes "everywhere". Also, I couldn't find a single empty cycle parking space amongst the 14000 at the railway station, so I tied my bike to a post with a "don't park your bike here" sign. Townmouse: I'd be very very happy to be able to report that the tide really had turned. For those who've not seen the Daily Mail article in question, click here. It's a very rare example of a cycle lane in the UK which has actually been built to the recommended width, as reported on by Britain's most xenophobic "newspaper". I think Kevin Love is wrong about walking. Nationally it has declined as much as cycling. Children used to walk to school, now many get driven. Generally, local authorities have little interest in measuring walking. Britain is as hostile to walking as it is to cycling; the infrastructure favours driving. As for cycling in London. Look carefully at the statistics and you'll find that Transport for London is only measuring cycling on a tiny number of main roads used by commuter cyclists. Cycle counts in my own outer London borough indicate a rise in cycling numbers on some main roads but stagnation or a decline on other roads. But even the figures for increased cycling are tiny in relation to driving. Modal share is the statistic that counts, but even here it may not indicate safe and attractive cycling conditions. Hackney has the highest modal share in London (around 8-10 per cent) but that has more to do with poor public transport links, proximity to the City and West End, and (I suspect) large numbers of single childless professionals, rather than good cycling infrastructure. The situation in Britain is very bleak for the future of cycling, because most cycle campaigners show no interest in learning from the Dutch model and demanding similar infrastructure. Instead we get feeble and demonstrably untrue excuses such as the roads being too narrow. Sadly, Freewheeler is right about the decline in children walking. These statistics were also published and I included them in a previous blog post. To summarise, in 1989 62% of 5-10 year olds and 48% of 11-16 year olds in Britain walked to school. Both have seen a steady decline and by 2008 these figures had reduced to 48% and 40% - approximately a 20% drop overall in children walking to school in Britain. Over the same period, the proportion of children being driven to school climbed by around 50%. While the driving rate is more or less static for adults (who already drive for the vast majority of their journeys), it's also the one mode which is increasing sharply for children in the UK. I would say that cycling is on the increase in UK, but I wouldn't use the word booming. I have moved to a new office which has limited car parking and as a result we have seen an instant increase in the numbers of people walking, cycling, taking the bus and sharing cars. The change is not entirely through use of the stick, the office has tidy covered cycle parking, reasonable storage lockers and good showers - far better facilities than we had in the old building, where 6 cyclists would be a good sunny day turn out. A quick count up at lunchtime gave 48 bicycles, 8 motorcycles and 240 cars. 5:1 ratio cars to cycles is quite something. I estimate that another 50 cycles can be accomodated (and another 40 cars). Pool cars have also been provided so if a cyclist needs to travel further than they might cycle they can do so. Infrastructure balance works both ways, removing some car space has just as much effect (probably more) as adding space for cyclists. Yes, I've seen somewhere else (not sure if it was an opinion or proper study) that parking issues and prices has a greater affect on peoples behaviour than fuel prices etc. I can't remember what the speculated reasons where though. Like Townmouse, Freewheeler & Anon, i'd agree that cycling is on the increase in the UK, albeit on a small scale. Although the numbers dropped off a little round here through the winter, enough carried on for the difference to be notable. Up in York, cycling is strong and according to a relative who lives nearby, continued unabashed. Slowly but surely, there are also more kids cycling to school. On my commute home the last couple of mornings I've seen quite a few, and the bike rack at my kids new school is usually full. Weather may well affect these numbers though as, surprise surprise, non seem to use mudguards! The big difference is that what we are seeing on the ground over here is probably (or to be more accurate, 'definitely') microscopic in comparison with the Netherlands, but it's a visible difference and an encouraging trend. I'm also no longer the only cyclist filling up panniers at our local supermarket, which is nice to see. What the UK is spectacularly bad at putting in place is decent infrastructure - and by that i'm criticising what has already been put in place - not the 'lack of'. But you are aware of that. If our planners actually produced something useful, it would undoubtably be more popular. Our local count seems to show fairly flat cycle numbers, though puzzlingly I have seen a graph that shows the same numbers as an increase (and not from someone trying to distort the view). Worryingly - I think I am observing a large increase in helmet wearing. No figures for this yet though. I went to the Spezi show last week and had my first experience of cycling in Germany; it was wonderful. I've cycled in London, York, Oxford and Cambridge and they are all, by and large, flat to flattish. The Nederlands, I have read, are also flattish. Ordinary folk are unlikely to cycle in hillier cities. imo. With reference to walkers, they already have a separate to motor vehicle facility in the pavement. Perhaps we should campaign for shared use rather than new facilities for cyclists? For many pavements it would only mean stopping the cars parking on them to provide the extra space needed. Finally, why do we in the UK so readily accept piecemeal approaches to the problems? Even the CTC seems happy to chip away at individual authorities rather than take on national government. 20's Plenty, cycle lanes/shared use, and the like are national problems and deserve national solutions I would have thought. @billy - Shared use is the worst cycle provision and so generally the least preferred option. Except by those drivers who are just interested in removing cyclists from 'their' road and not caring who is inconvenienced. Shared use is completely unsuitable for the speed of many cyclists. By being on the pavement rather than on the road, you lose priority at junctions and are less likely to be seen/expected by drivers. Junctions are always the danger area, so any provision make it more difficult for cyclists should be avoided. It also can upset pedestrians and make it more likely that people will cycle on other pavements where they are not supposed to. Not so Neil. Shared use is not the worst provision. it was working fine in Germany last weekend. You don't have to lose priority at junctions. Plenty of the German junctions I saw had cyclist priority, and the cars slowed down and gave way. It was wonderful. Imo, we should start with what we have, improve on that and then go for the pipe dreams. If cyclists want to ride in such a way that they can't share space with a pedestrian I'd suggest that we aren't going to move forward in my lifetime. We need pedestrians working with us for maximum campaigning numbers. Billy: I have to point out that the infrastructure you saw in Germersheim looks very second rate compared with the Netherlands. Shared use is not the norm in NL because it doesn't work well. It's extremely rare to find places where cyclists share with pedestrians in any numbers. @billy - shared use in UK is almost always without priority. If you can change that, then that is significant and worthwhile. Changing the priority at junctions on a general basis would be a major step for the UK (and is something that National government would need to be involved in). If you can manage that, then I would think it well worth pursuing separation as well. And while it is acceptable to share space with pedestrians in pedestrians areas (town centres, etc where there is plenty of space and it is a limited area), or for short sections where other options are worse, I really cannot see that it is acceptable as the default. And I don't see that pedestrians will vote to have more sharing of their footways with cyclists. As always, you are slightly misrepresenting the real case. Firstly who says that cycling is 'booming'? I live in the UK and I've not heard anyone say that. The best anyone could say is that cycling has stopped declining and may have slightly increased. The data you cite is from the National Travel Survey. 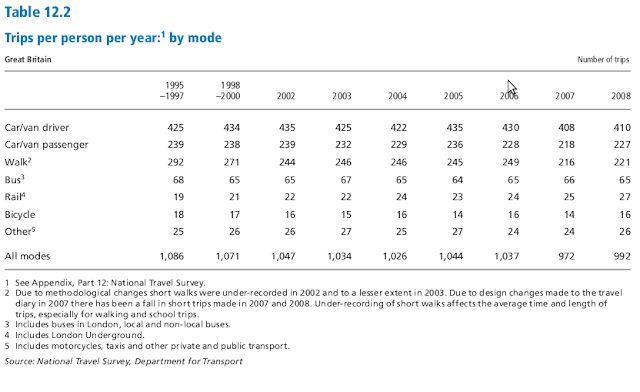 It shows that cycle trips remain at just 16 a year. A pathetic level. But those trips have been getting slightly longer recently, probably because more of them consist of commuting journeys, and more of them are in London, where trip length is longer than elsewhere. But there is another data set: the Traffic Census. This shows that cycling levels have increased slightly over the last 15 years or so. Very marginal, but they claim that 2008 was the highest level for many years. Incidentally Sustrans deny the veracity of both of these figures because they only measure on road cycle use, and don't cover cycle tracks away from the road network, or mountain bike use. Anonymous: You may not have heard it, but many people use about the expression "booming" about UK cycling. I assume you're talking of the table on page six of the DfT paper. What's the margin of error on these figures ? If you plot them you won't see much of an upward trend. Rather, every figure from the 1950s is greater than every figure from the 1960s, the 1960s show a very steady downhill trend, lower every year, and since then cycling has flatlined in the UK. In fact, I've plotted the figures for you, and you can see them here. The rise in motor traffic makes it difficult to see what has happened to cycling, so I've also plotted just the cycling figures. You have to look really hard, and really want to see it, to see an increase in the last few years. I think Sustrans perhaps do have a point, but it's only a small one. There simply isn't much cycling going on in the UK. BTW, do you realise that the video you pointed to is complaining about the bad conditions for cycling at that roundabout ? Generally you don't have to contend with things like that when cycling. Yes - I do realise what the video is showing. As you are no doubt aware, conditions in the Netherlands aren't always perfect and drivers aren't very well behaved. "The best anyone could say is that cycling has stopped declining and may have slightly increased." There is far too little progress in the UK. You are right, the thinking is still dominated by 'on the road' types. In part this springs from the fact that where provision is attempted for cyclists, it is far far below the standard expected in most countries and then isn't maintained. But please do keep doing your best to explain what good infrastructure looks like and how it works!